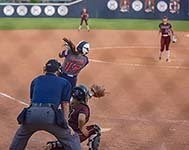 HOME RUN SHOT - Dawson junior pitcher Courtney Day (17) helped her own cause with a two-run shot against the Pearland Lady Oilers. The Lady Eagles nipped the Lady O's 7-6 in a district showdown. 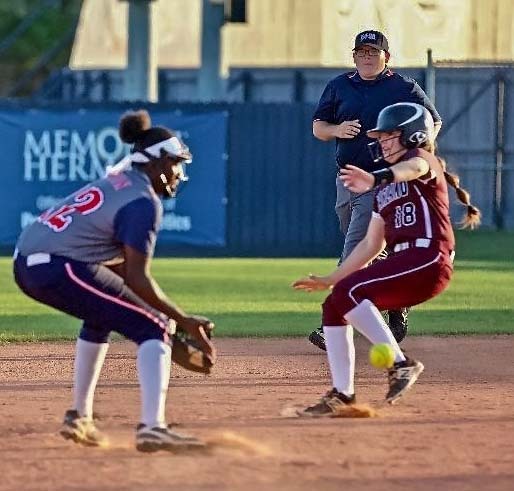 PEARLAND — For the second straight season, the Dawson Lady Eagles have swept their cross-town cousins in softball. This time it appeared that Pearland might break the string, but a late-inning rally gave the Lady Eagles a crucial district win. Dawson entered the contest tied for the league lead with Brazoswood. With only one game remaining in district, the Lady Eagles should finish the regular season as co-champions unless they an get some help from the Lady Oilers who can still pin a loss on the Lady Buccaneers and take away their share of the league title. Pearland jumped out to a 3-0 lead in the top of the second, but Dawson answered with three runs of their own in the bottom of the third to tie up the game 3-3. The Lady O's added two more in the fourth for a 5-3 lead, but the Lady Eagles added runs in the fourth and fifth frames making the score even at 5-5. 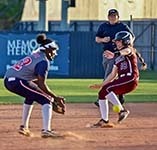 SAFE AT SECOND - Pearland's Alyssa Fort slides in at second base against Dawson. Fort was 2-for-2 at the plate with one run scored and three RBIs in a losing cause. In the decisive sixth inning, Lady Eagle leadoff hitter Kirsten Williams reached on an error and Peyton Ellerman followed with a bunt single. Courtney Day, who blasted a two-run home run in the third, was intentionally walked. Izzy Richey then reached on an infield single to give Dawson a 6-5 lead and, one out later, Olivia Johnson drew a bases-load walk for a 7-5 advantage which would turn out to be the final score. "Was it pretty? No. Did we struggle in all areas? Yes, including the mound, which is not typical," Dawson head coach Katelyn Welch said. "The main thing about tonight is that, typically, we're not a good comeback team. "We got down 3-0 and we did whatever it was to make something happen to win this ballgame. We've won these last three games which we needed to win. At the end of the day, that's what is most important. That puts us in the best position we can be in to get first place." Leading the Pearland offense was Ashlin Moreno who was 2-for-3 with one run scored. Alyssa Fort was 2-for-2 with a triple, one run scored, and three RBIs. Dawson was led by junior pitcher Courtney Day who was 2-for-3 with a run scored and a two-run homer. Day was the winning pitcher allowing six runs on six hits with eight strikeouts and two walks. Dawson committed five errors in the first three innings. Pearland used three pitchers in Natalie Trujillo, Alyssa Fort, and Natalie Myers who took the loss. 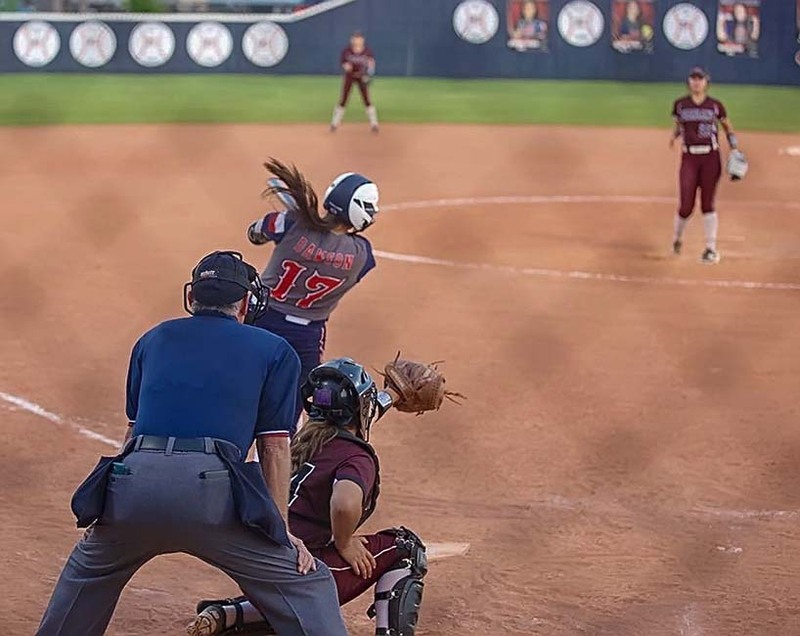 Sydney Franco drove in five runs and Molly Ellinger added three RBI as Dawson rolled to a 15-1 District 23-6A softball victory over Alief Elsik. The win improved Dawson to 9-1 in league play and kept the Lady Eagles tied for the top spot in district with Brazoswood. If Dawson (16-7) can win its final two district games against Alief Taylor and Alief Hastings, it will finish no worse than a tie for first. Courtney Day, who had two RBIs for Dawson, pitched one inning and recorded three strikeouts. Adeline Cox pitched four innings for the Lady Eagles and struck out three. Pearland, which has already clinched a playoff berth, improved to 7-4 in district with a 7-3 win over George Ranch. The Lady Oilers will finish as the No. 3 or No. 4 seed entering the postseason. Pearland scored three times each in the fourth and fifth innings to avenge a loss in the first round of district. Lauren Ochoa had two hits for Pearland while Ashlin Moreno drove in a run for the Lady Oilers. Natalie Trujillo and Alyssa Fort combined to hold down the Lady Longhorn bats.